IDBI Bank Recruitment 2019: Good news for the candidates who are searching for latest job openings in IDBI Bank. Yes, the IDBI Bank authority published an IDBI Bank Recruitment 2019 Notification for 40 Manager, Deputy General Manager & Assistant General Manager Posts. For this recruitment, the application process starts on 26th March 2019 and the application process end date on 8th April 2019. Interested candidates can check the complete details about IDBI Bank Jobs 2019 from this article. Through this post, we had provided Eligibility Criteria, Selection Process, Important Dates, Application Fee, Salary, Application Process details in clear explanation. So all the aspirants should check those details and apply for IDBI Bank Job Vacancies 2019 through Online quickly. For the comfort of the candidates at the end of this page, we have given a link to download the IDBI Bank Recruitment 2019 Notification. In this article, we had provided complete details about IDBI Bank Recruitment 2019 Notification. Candidates can check the eligibility criteria and apply for IDBI Bank Jobs 2019 before 8th April 2019 through online. If any candidate fails to meet the eligibility criteria then those application forms rejected by the IDBI Bank officials. Candidates can also check the official website to know more details about IDBI Bank Recruitment 2019. To apply for IDBI Bank Recruitment 2019, candidates must have possessed Degree/ Post Graduate degree/ MBA/ CA/ ICWA from a recognized university. Aspirants can check the official notification to know more details about education qualification. In this section, we had provided post wise vacancy details for IDBI Bank Recruitment 2019. Candidates can check those details and apply for IDBI Bank jobs. 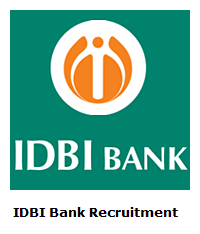 To apply for IDBI Bank Recruitment 2019, candidates can check the below mentioned information. Candidates can check the Age Limit details from this section. Manager: Age limit should be 25 to 35 years. AGM: Age limit should be 28 to 36 years. DGM: Age limit should be 35 to 45 years. Candidates can check the official notification to know more details about age limit and relaxation. The IDBI Bank officials will conduct the following selection rounds to select the candidates for Preliminary screening, Group Discussions (GD)/ Personal Interview posts. Candidates can check the PayScale details from this section. IDBI Bank main page will open. Carre’s option is available in the top section. Go to “Current Openings” and click on it. Fill all important details & upload Photo, Signature. Later cross-check details and hit on submit button. Through this article, we had provided complete information about IDBI Bank Recruitment 2019. Eligible candidates should apply for 40 Manager, Deputy General Manager & Assistant General Manager posts before the end date. Keep visiting Sarkari Recruitment to know instant updates about all government job recruitments. Thank you.